Only ₹2,999 (Incl. GST), Save upto 50% or more, Book Now! Swimming pool, Wi-Fi & business centre etc. 28 Km away from Maharana Pratap Airport. Wi-Fi, Swimming pool, Parking, Restaurant etc. Wi-Fi, Indoor Swimming Pool, Parking, Bar etc. Television, Swimming pool, Minibar, Air-conditioner etc. Wi-Fi, Parking, Outdoor pool, Air-conditioned etc. 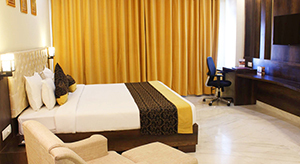 If rooms are Sold Out or you need for Future Dates, kindly fill your desired dates & city. Our team will work on your enquiry! Select New Delhi Bangalore Chennai Hyderabad Agra Ahmedabad Ajmer Amritsar Ara Bhatinda Bhubaneswar Chandigarh Coimbatore Dwarka Gangtok Ghaziabad Goa Gurgaon - NCR Delhi Hampi Haridwar Hubballi-Dharwad Indore Jaipur Jalandhar Jim Corbett Jodhpur Karwar Kasauli Katra Khajuraho Kishangarh Kochi Kollam Lucknow Madurai Manali Mangaluru Moradabad Munnar Mysore Neemrana Puducherry Puri Raipur Shirdi Sultanpur Thiruvananthapuram Udaipur Ujjain Varanasi Preferred Destination not available? Room booking for Self, Spouse and Kids or Parents only. Welcome to www.icanstay.com, an e-commerce portal owned and controlled by FIRST TIME TRAVELLERS LTD. and its affiliates. 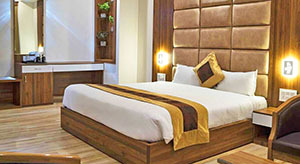 We at www.icanstay.com provide you an access to a wide range of Hotels for your comfortable stay, subject to the terms and conditions set out on this page. We collect personal information from you, such as Name, Contact Information, Mailing Address etc, voluntarily submitted by you as “USER”/“CUSTOMER”. If you use this website, you are responsible for maintaining the confidentiality of your account and password and for restricting access to your computer to prevent unauthorized access to your account. The information provided by you as “USER”/“CUSTOMER” is kept secured and is only accessible to authorized employees, agents of www.icanstay.com. You, by logging in or using this website agree to accept responsibility for all activities that occur under your account and password. You should take all necessary steps to ensure that the password is kept confidential and secure and should inform us immediately, if you have any reason to believe that your password has become known to anyone else, or if the password is being, or is likely to be, used in an unauthorized manner. Please ensure that the details you provide us with are correct and complete and inform us immediately of any changes to the information that you provided while registering. You can access and update much of the information you provided us with in the Your Account area of the website www.icanstay.com. FIRST TIME TRAVELLERS LTD. reserves the right to refuse access to its website, terminate accounts, remove or edit content at any time without any prior notice to you. You agree, understand and acknowledge that the website is just a Facilitator and an online platform that Connects Hotel and Customers. The website does not guarantee you about the quality of service being provided by the partner hotels. We will do our utmost to ensure that availability of the website will be uninterrupted and that transmissions will be error-free, subject to technical problems which are not in control of the Company. Also, your access to the website may also be occasionally suspended or restricted to allow us for repairs, maintenance, or the introduction of new facilities or services at any time without prior notice. We will attempt to limit the frequency and duration of any such suspension or restriction so that our “USERS”/“CUSTOMERS” have a hassle free access to www.icanstay.com. to send, use or reuse any information or data that does not belong to you; or is illegal, offensive (including but not limited to material that is sexually explicit content or which promotes racism, bigotry, hatred or physical harm), deceptive, misleading, abusive, indecent, harassing, blasphemous, defamatory, libelous, obscene, pornographic, pedophilic or menacing; ethnically objectionable, disparaging or in breach of copyright, trademark, confidentiality, privacy or any other proprietary information or right; or is otherwise injurious to third parties; or relates to or promotes money laundering or gambling; or is harmful to minors in any way; or impersonates another person; or threatens the unity, integrity, security or sovereignty of India or friendly relations with foreign States; or objectionable or otherwise unlawful in any manner whatsoever; or which consists of or contains software viruses, political campaigning, commercial solicitation, chain letters, mass mailings or any "spam”. Users of this website may post reviews, comments and other content; send communications; and submit suggestions, ideas, comments, questions, or other information, as long as the content is not illegal, obscene, abusive, threatening, defamatory, invasive of privacy, infringing of intellectual property rights, or otherwise injurious to third parties, or objectionable and does not consist of or contain software viruses, political campaigning, commercial solicitation, chain letters, mass mailings, or any form of "spam." In the event a user uses a false e-mail address, impersonates any person or entity, or otherwise misleads as to the origin of any content, www.icanstay.com and FIRST TIME TRAVELLERS LTD. reserves the right to remove, refuse, delete or edit any content that in the sole decision / observation of www.icanstay.com and FIRST TIME TRAVELLERS LTD.that violates these Conditions of use and, or terminate your permission to access or use this website. That the “USERS”/“CUSTOMERS” at first have to buy Vouchers that will be offered at a price fixed by the Company from time to time and will be available at the website/Mobile App www.icanstay.com. It is agreed by the “USERS”/“CUSTOMERS” that at the time of purchasing a Voucher, the “USER”/“CUSTOMER” will disclose all necessary details and information as will be asked for on the Sign-up page of www.icanstay.com. The Voucher(s) can be redeemed for Self, Spouse, Kids and parents. The Voucher(s) can be bought in someone else name also, but the person in whose name it has been bought will be able to redeem the same. The Voucher(s) can be gifted also. However, gifted Voucher(s) are not refundable. The Vouchers are for individuals to be used individually or for family stay and they cannot be bought as a corporate entity. That the Voucher is valid for a period of 11 months from the date of buying the Voucher and the same is valid for single end use. The “USER”/ “CUSTOMER” also understands that the Voucher is non-transferable. 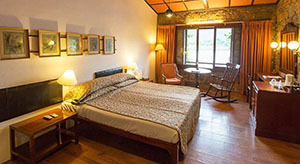 That the “USER”/ “CUSTOMER” also agrees to the offer of www.icanstay.com that the availability of rooms is not guaranteed as the same is subject to the availability of Rooms inn the Partner Hotels at time and in the area of choice opted by the “USER”/“CUSTOMER” However, the website also offers a GUARANTEED STAY PLAN under which the website offers a guaranteed stay subject to certain terms and conditions. That the “USER”/ “CUSTOMER” also agrees and acknowledges that he will be informed about the availability after 12.00 Noon for the same day. 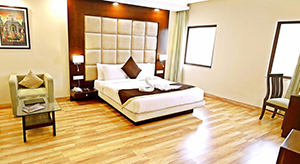 However the company has reserved the right to inform about the availability of Rooms in the advance. That the “USER”/ “CUSTOMER” also agrees and acknowledges that the Website has set its own parameters to send notifications of availability of rooms as per the Choices opted by the customers on first come first serve basis. The company has also set its own parameters to reserve a part of available inventory for walk in customers. The Website reserves the right to change these parameters at any point of time without any prior notice. That the “USER”/“CUSTOMER” can only avail a room against the Voucher already purchased by redeeming it on the website / Mobile App www.icanstay.com. The FIRST TIME TRAVELLERS LTD. through their website / Mobile App -www.icanstay.com discloses the name and area of the Luxury hotel only after the “USER”/“CUSTOMER” redeems the Voucher. That the Voucher can be redeemed by entering the “UNIQUE VOUCHER NUMBER” mentioned on the Text Message or email sent to the customer after they buy the Voucher. The “USER”/“CUSTOMER” also agrees that a Voucher once redeemed cannot be used again. www.icanstay.com accepts online payment only. The “USER”/“CUSTOMER” also agrees that he has read and understood the Frequently Asked Questions. That the “USER”/“CUSTOMER” has read, understood and acknowledged the Renewal Policy of this website. That the “USER”/“CUSTOMER” has read, understood and acknowledged the Refund Policy of this website. In cases of investigation of fraud / misuse of service/content we may share information with governmental agencies or other organizations assisting in investigation or prevention. We may do so when (1) permitted or required by law; (2) trying to protect against or prevent actual or potential fraud or unauthorized transactions; or, (3) investigating fraud which has already taken place. That icanstay.com is a trademark owned and registered in the name of FIRST TIME TRAVELLERS LTD and the website www.icanstay.com is a copyright owned by FIRST TIME TRAVELLERS LTD. a company incorporated under the provisions of the Companies Act, 2013 having its registered office at 8B, Ganpati Apartments, 122/1, Toot Sarai, Malviya Nagar, New Delhi-110017. It is disclosed to all the “USERS”/“CUSTOMERS” that the right to use the registered mark is only with FIRST TIME TRAVELLERS LTD. and any infringement of this ownership will be governed by the INFRINGMENT POLICY mentioned in www.icanstay.com. When you visit www.icanstay.comor send e-mails to us, you are communicating with us electronically. You will be required to provide a valid phone number while purchasing a Voucher from us. We may communicate with you by e-mail, SMS, phone call or by posting notices on the website or by any other mode of communication. For contractual purposes, you consent to receive communications including SMS, e-mail or phone calls from us with respect to your order or campaign. The Governing law will be the Law of India and every transaction will be governed with the laws of India. You agree, as we do, to submit to the exclusive jurisdiction of the courts at Delhi if any dispute arises. Our website includes social media features such as Facebook, Twitter, Pinterest, blogger etc. Individual electronic social network may also be used to promote or share the incentive of the business. Please note no personal information can be shared on the website www.icanstay.comwithout the approval of the www.icanstay.com or FIRST TIME TRAVELLERS LTD. This website is operated by FIRST TIME TRAVELLERS LTD. for the www.icanstay.com website and Mobile apps, you could contact us by visiting www.icanstay.com/contact.